Christi Hessels and her family are beginning their fifth year as part of Liberty Prep. Christi, her husband Luke and their children Cooper, 6th grade and Jenna, 4th grade moved here from the Washington, DC area about 5 years ago. They have loved coming home to the South and living in the Lake Norman area. 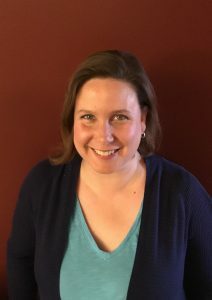 Drawing from her experience on Capitol Hill, Christi enjoys organizing events and helping people get connected and build community. She would like to focus on strengthening parent involvement by making PTF efficient, manageable and fun! New to the PTF Board in 2017-2018, Tracey Shott will be serving in the role of Vice President. Tracey & her family joined the Liberty Prep community in 2015-2016 when her oldest son Ethan enrolled in Kindergarten. This year, as Ethan moves up to Second Grade, his younger brother Tyler joins him at the Harbor Campus as he begins Kindergarten. 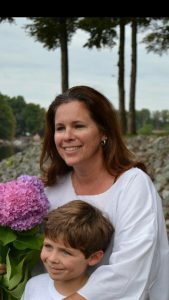 Having both boys in the same school introduces the prospect of Tracey serving in a greater volunteer capacity at Liberty Prep, which she considers an opportunity to contribute toward expanding God’s Kingdom in our local community. 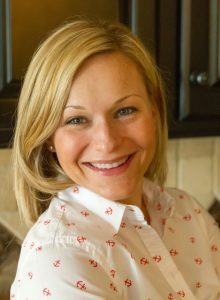 Her goal is to help share the workload that goes into making the PTF events and fundraising efforts successful and to grow stronger relationships with fellow Liberty Prep parents. Debbie Garrett has worked with children and youth for over 20 years. 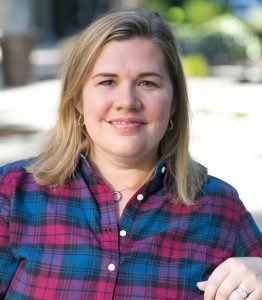 She has worked in childcare, volunteered in youth ministry, worked for two different Christian camps and conference centers and even volunteered in a center for troubled teens. Debbie studies child psychology at Liberty University where she met the love of her life. She has been married to Nate Garrett for almost 17 years. As a pastor’s wife, she partnered with her husband for 13 years in local youth ministry. For the past 4 years, she has travelled around with Nate and their two children, to camps, conferences and events around the country in full-time evangelism, where they have seen thousands make decisions for Christ. They have been a part of Liberty Prep since its beginning. Their son Luke is in 8th grade and daughter Leia is in 5th. Nate became the Campus Pastor at Liberty in fall of 2018. Debbie has loved being a part of PTF and she hopes to impact our school in a positive way that ultimately brings glory to the name of Jesus. Galatians 2:20 I have been crucified with Christ and I no longer live, but Christ lives in me. The life I now live in the body, I live by faith in the Son of God who loved me and gave himself for me. Gina Fieber, husband- Chris, and daughter- Ashley have been at Liberty Prep since Ashley’s freshman year 2016-2017. Prior to that, Gina homeschooled Ashley after their move here from Virginia at the beginning of 4th grade through 8th grade. Gina and Chris are originally from Indiana, both with undergrad degrees in Chemical Engineering (Tri-State University & Purdue) and MBAs from Duke. They met at Eli Lilly Pharmaceutical during their first jobs after college and moved to Virginia to work at AlliedSignal/Honeywell shortly after they got married in 1995. They love the South now and it would be very difficult to get them to move back to the cold weather of anywhere North now. 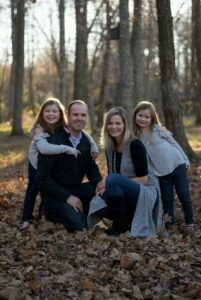 The Fieber family loves reading, board games, traveling, spending time on Lake Norman wakeboarding and water skiing, and volunteering together. Tim & Cindy Carmichael have two daughters at LPCA. Merritt is enjoying her first year in high school while serving as a student ambassador for Liberty Prep and Whit has had a great first year in middle school playing for the volleyball team and being on the cheer squad for basketball season. Cindy and her husband serve on the Lake Norman Young Life committee, which is a ministry focused on introducing high school students to a real relationship with Jesus Christ. As well as working with young people, Cindy loves being a part of organizing simple ways to show love for the staff at Liberty Prep. Having amazing people working with our students makes staff appreciation an easy job! Hillary Cole is the Social Coordinator for PTF but has served on the PTF committees for the last two years. She is married to Bryan and mom to Hannah (4th grade) and Hazel (1st grade). A native North Carolinian, she has lived in Mooresville for the past 8 years and is a member of Mooresville First Presbyterian. If you love having fun, laughing a lot, and being surrounded by food and friends, contact Hillary to find out how you can help! Ginger D. Rushing is a believer in Jesus Christ, wife to Craig, mom to Ashley, occasional writer, witty conversationalist, and semi-professional dog wrangler. She is former communication professional and a current stay-at-home mom/gold-level rewards member at Starbucks. Ginger is a proud South Carolinian but graduated from Belmont University in Nashville, TN, before moving to Washington, DC for work. 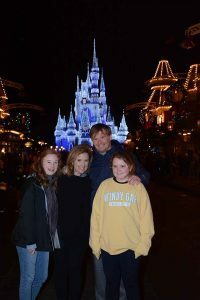 While in DC, Ginger met her husband Craig, and together, they returned to his native North Carolina in 2010. This is the Rushing family’s third year at Liberty Prep. They are excited to be involved in the LPCA community and grateful to God for this incredible school. Go, Patriots!